Our campers have amazing space both for cargo and personal sleeping space. Our camper is the smallest model when closed for easy towing, yet it is the largest when setup. When set up the camper is 14 1/2' long! allowing for personal dressing room and private sleeping space. Each camper comes equipped with a queen sized air mattress or upgrade to a comfy sleeping pad. The windows around the bed have a tinted film to allow sunlight and privacy. On those hot days it serves to keep your cold A/C in while still being able to enjoy the view of the outdoors. Yes each camper has an optional attachment for an A/C unit! if for any reason you are not completely satisfied with your purchase we go to great lengths to make things right. We have the leading products in the industry. Leading the industry for over 40 years and stand by our work. We have great customer support! We operate between the hours 9 a.m. - 4 p.m EST feel free to call with any questions. Our campers provide comfort and convenience to see the open roads like never before. Take our campers anywhere you can go. don't waste any more time searching for the best hotel deals, when you travel take yours with you. Find out how much you can a save a with traveling with our campers. All models have extra cargo space to haul everything you need for any trip. See what camper has the best fit for you! WOW just a great trailer we decked our trailer out and love it. The spoiler is a must for this trailer makes it look awesome! The space inside the trailer is awesome we can fit all our gear and weeks of clothes without packing anything on our bike. We love our trailer so much we take it everywhere. We just can't go back to packing up our bike. We don't even notice a change in our MPG. I have had mine for over 20 years, I've had to replace minimal things over the years but I have always gotten great customer support. They are very helpful and were willing to work with me for anything I needed. Even over the past 20 years my tent still looks great with little noticeable fading in color, with no leaks! I recommend getting one for any long trip or rally. We take ours everywhere and always brings lots of attention when we set up our camper so quickly. We have been building quality pull behind trailers for small cars and motorcycles for outdoor recreation since 1974. Our trailers let you leave the world behind or take it with you! 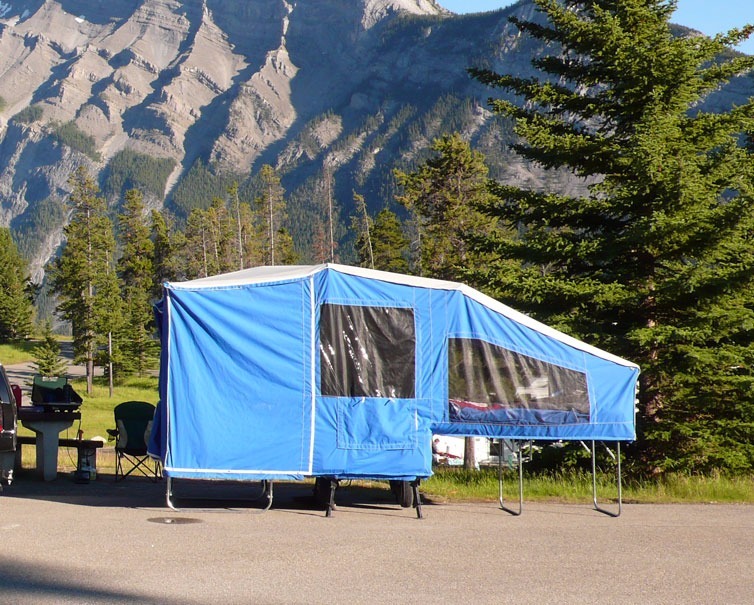 Get a camper trailer to give you the option to explore and stay where you want to stay. Go touring without any reservations, see the sites you wouldn't see from out your hotel window. Don't deal with overbooked hotels or pay a fortune on rooms, make a smart investment with a Time Out Camper and go. Our campers have amazing space both for cargo and personal sleeping space. Our camper is the smallest model when closed for easy towing, yet it is the largest when setup. When set up the camper is 14 1/2' long! allowing for personal dressing room and private sleeping space. 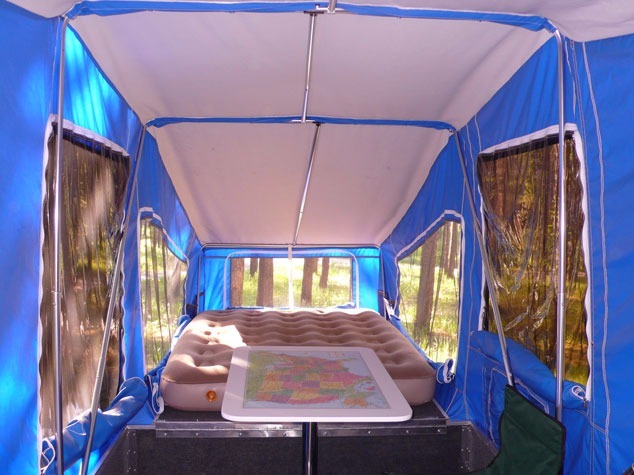 Each camper comes equipped with a queen sized air mattress or upgrade to a comfy sleeping pad. The windows around the bed have a tinted film to allow sunlight in and privacy or on those hot days keep your cold A/C in while still being able to enjoy the view of the outdoors. The bed area has sown in pockets on both sides to store his and hers personal items. Don't like camping? But love the open road? Take all the luxuries you have become accustomed to with your choice of style and size of motorcycle cargo trailer. We have a wide variety of options to match the look and feel of your motorcycle or car. These cargo trailers are great for hauling your luggage and toys. At Time Out Trailers we love our trailers and make them custom for you and your needs. See what we built just for you! 574-294-7671. Trailers made here in the USA, support your local USA Trailer store. 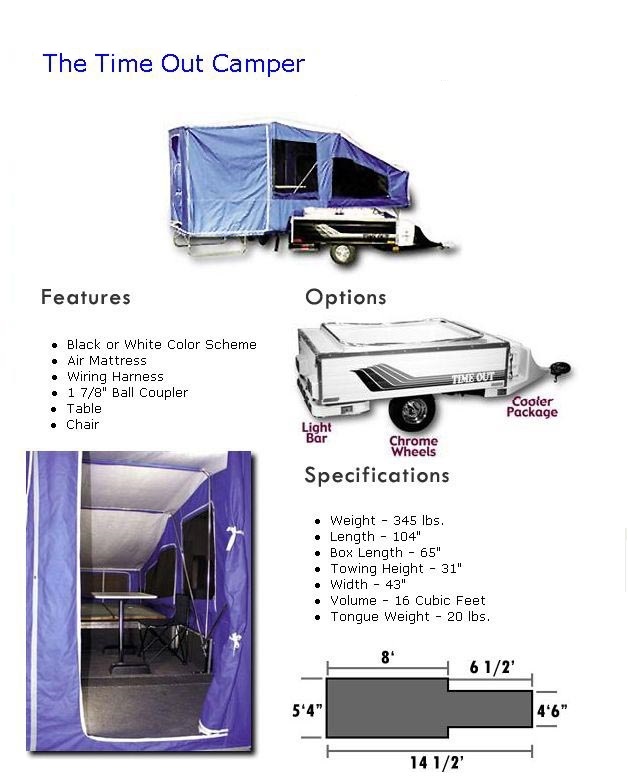 Our motorcycle camper trailers are the largest when set up out there! So it's hard to believe that we are also the smallest trailer closed. You won't even notice your towing it! Pulling trailers have a low impact on MPG, some riders experience little to no change. Find solace in knowing you have the best trailer out there. 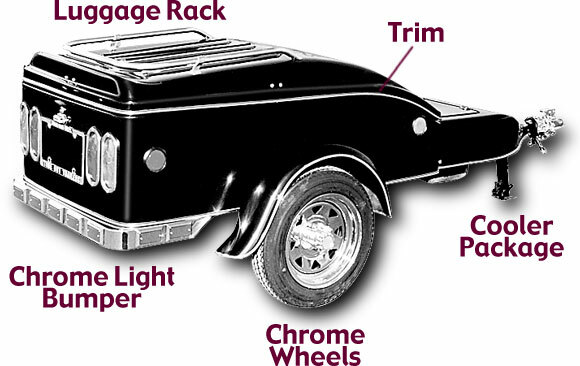 We are the home of the Cycle Mate motorcycle cargo trailers, since 2005. Let us help you find the trailer you need, give us a call! We have over 40 years of experience let us know your questions, we have answers. Copyright © 2013 Time Out Trailers, Inc.. All Rights Reserved. Built with Volusion.